In early November, I was treated to a tour of Sky Studios by Rachel Depree and Briana Inlow who lead stakeholder engagement and reporting for Sky’s approach to sustainability, Seeing the Bigger Picture. It was all very exciting. I went backstage and met the presenters (Di Dougherty and Darren Campbell) of the Sky Game Changer Series. They were preparing for the new edition with Olympic hurdler Perri Shakes-Drayton who was to share hurdling tips with the Game Changers young school-kid audience. While I didn't learn to hurdle (I am somewhat hurdlingly challenged) I was able to watch the program that aired on Sky Sports TV the following day. Sorry to say, I still can't hurdle... but lots of kids now can. The fabulous thing about the Game Changer series is that it's not only changing games, it's changing the lives of thousands of young children. Now in its second year, the program invites schoolchildren from all over the UK to take part in a live show that airs every Saturday morning, targeted at kids between ages 8 and 12. Each show has a different sports-related theme and hosts sporting superstars or well-known sports personalities to inspire and help the kids discover or deepen their love of sports. Anyone can apply for a free ticket and take part in the fun. But it's more than fun. In our current sedentary, electronic-game, TV-screen, computerized, interactive, tablet-phablet-laptop-desktop digital world, the dangers of kids being glued to big screens and small screens for most of their spare time is quite a real one. Game Changers is helping to draw kids into the world of sports and off their armchairs - even watching the show on TV encourages active participation, alongside the hundred or so kids that attend the live show each week. This is a CSR initiative that brings value to the community in an area of genuine social need, while also providing Sky Sports with an attractive high-rating TV show as part of their programming. Sounds like a win for business and a win for society. For me, seeing the set and meeting the people in person also helped me get a sense of the passion and purpose behind the camera lens. While at Sky, I also had the opportunity to visit and talk with students who come to learn at Sky Academy Skills Studios. Sky Academy is a set of initiatives which use the power of television, creativity and sport to inspire young people and help them build skills and confidence. Sky Academy Skills Studios provide an interactive learning experience that takes schools behind the scenes at Sky. Students build life skills by using state-of-the-art technology to make a TV news report on subjects they’re studying at school. Over 30,000 young people aged 8 to 18 have visited Sky's Skills Studio in West London since it opened in 2012 - current rates of visits are around 1,000 per month. This is a fantastic way of using core business skills that are part of what Sky does every day as an opportunity for young people to develop skills like teamwork, communication and creativity, handle technology, and perhaps even find their vocation. The Studios are quite spectacular and offer an amazing experience for young people in a very real simulation setting. Talking in front of a camera is no easy feat... as I well know when I personally tried (and failed) to record a series of videos on sustainability. Building both the skill and the self-confidence to get your message through is a gift for life that the Skills Studios offer to thousands of young people. Game Changers and Sky Academy Skills Studios are just a small part of Sky's overall approach, which they call Seeing the Bigger Picture. Take a look at Sky's most recent Seeing the Big Picture Summary Report for 2014. Sky's website provides a more comprehensive overview of their initiatives and performance data, as well as news articles and blogs posted throughout the year. Seeing the Bigger Picture is integrated as part of Sky's business model and is based on three pillars: making a contribution, responsible business practices, and inspiring action in the community to improve quality of life. As part of its reporting, Sky calculates is economic contribution to the UK economy and quotes a significant £6bn added to the economy and creation of 117,000 direct jobs. In addition, Sky is the biggest commercial supporter of the creative and sports industries in the UK, working with more than 150 production companies in the last 12 months, providing a platform for their creativity and helping them grow their own businesses with a £2.6 billion content and programming investment. In addition to economic impact, however, it is always interesting for me to consider the more core-business social impact of the programming and broadcasting choices that media companies make. I have tracked the work of the Media CSR Forum, of which Sky is a member, for some time now, and find the Mirrors or Movers publications - is the media a reflection or a transformer of society? - to be insightful and thought-provoking. "For Sky, we know reducing our environmental impacts and making sure families can stay safe online are what our customers expect of us day to day. They’re simply doing the right thing as a business. The real opportunity for Sky is the ability we have to inspire people to take action through our presence in over 40% of UK and Irish homes. We’re really proud of Sky Academy, which builds on our strengths in TV, sport and the arts to help young people unlock their potential. The stories of those who’ve taken part are inspiring. Our challenge is to keep making sure we capture the value this is creating for Sky and for wider society. We’d love for people to take a look at our reporting and tell us what they think. Alternatively, they could tune in to Game Changers on Sky 1, Saturday mornings, and practice their hurdling!" GSK Romania is an extremely focused organization. Here's the reason. "Romanians continue to have one of the lowest life expectancy rates in the European Union, with 77.3 years on average for women, the lowest in the EU, and 69.8 for men, second lowest after the Baltic countries, according to OECD Health at a Glance 2012 data. Heart, circulatory and respiratory diseases and cancer are the main causes of death in Romania. The infant mortality rate in Romania (deaths of infants under one year old per 1,000 live births) is double the average European rate." Isn't that a compelling motivator for a healthcare company? It's at the core of GSK Romania's business and corporate responsibility activities. You can read more in GSK Romania's 3rd annual Corporate Responsibility Report (and second report in accordance with GRI G4 core guidelines) that was published just this week. Once again, I supported GSK Romania in developing and preparing this report. It's always inspiring to work with a company so committed to making a positive impact. Romania is a country in Southeast Central Europe with a population of almost 20 million in an area of around 238,000 square kilometers. The world life expectancy map, which is based on World Health Organization statistics from 2011, shows that Romania is ranked the 78th country in the world for life expectancy - up to four years lower than most other countries in the European Union. Only Latvia and Lithuania have a slightly lower rate. It's not just about length of life - a few more years here or there. It's also about the quality of life... healthy life expectancy. GSK Romania has a mission to advance health and well-being in Romania by supporting healthcare infrastructure and patients through awareness, education, supply of innovative medicines and healthcare products. A significant part of the problem in Romania is the lack of consistent government priority for healthcare funding and reform of the healthcare infrastructure. Many governmental changes have led to discontinuity in policy reforms and lack of progress in critical healthcare development over several years, such as a revision of the reimbursement list of medicines to enable access to life-saving new drugs for patients in Romania. This is the context in which a local company, part of a leading global healthcare concern, operates. This is why it is important for the local subsidiary to know the unique local conditions, needs, challenges and expectations, and ensure that its business and corporate responsibility strategy is aligned with the local, not only global, needs of society. Drawing on a wealth of resource, innovation, capability and policy direction at global level, GSK locally has the opportunity to make a big difference to the lives of Romanians... not only the length of their lives but also the quality of life and the way people are able to enjoy healthy lifestyles. This is the real value of local reporting. It's a reflection of the engagement, planning and delivery of local positive impact. GSK Romania has been committed to doing this since its start in Romania since 1989, and has been publicly reporting on progress for the past three years. An example of a defining local issue, very relevant to the state of healthcare in Romania, is the doctor exodus. In a country with a low rate of medical doctors in proportion to the population needs (Romania has 2.4 doctors per 1,000 citizens, one of the lowest rates in Europe and well below the average of 3.6 doctors), Romania has been suffering from an exodus of doctors which has reached a level of more than 14,000 doctors in the past few years, who seek to make a better living in other countries where they can be paid more, gain access to professional learning and development and feel respected and valued in their profession. In many cases, due to the challenges they face in Romania, they have been packing up and leaving. This is undermining the quality of healthcare services and accessibility to treatments for patients. GSK Romania has supported an initiative designed to reverse this trend - a campaign called “My profession: doctor in Romania”, driven by the Foreign Investors Council, through the Council's Healthcare Task-force which is led by GSK Romania. The campaign aims to build widespread recognition for the role of doctors in Romania and provide practical support, including through new legislation, to encourage doctors to stay in the country for the benefit of Romanian patients. The campaign projects positive examples of doctors who decided to stay in Romania and has received widespread attention through active media communications and even won a European marketing award. This specific issue in Romania is just one of the areas GSK Romania is connecting with local healthcare imperatives and using its resources, leverage and commitment to improve the situation. Apel pentru companii - Pascal Prigent from De Profesie Medic on Vimeo. Check out the video above (it's in English) with former GSK Romania General Manager Pascal Prigent at the launch of the "My profession: doctor in Romania" campaign, in which he explains that healthcare is a critical part of the economy. GSK Romania's continuing role in supporting the campaign is now led by GSK Romania's current General Manager, Barbara Cygler. GSK Romania remains one of the few local companies in Romania - and I believe still the only one in the Romanian pharma sector - to publicly disclose its performance and practices. Take a look. Give feedback. Last Thanksgiving, I posted about how Thanksgiving shows up in Sustainability Reports. This year, renowned commentator and sustainability writer, Marc Gunther, inspired me to write another Thanksgiving post. Marc expressed his thanks to sustainability leaders who are doing great work. Thank you, Marc. I echo that and join in the applause. However, no less worthy of mention are the folks that battle away, year after year, to fill our inboxes and download queues with annual Sustainability Reports. I love opening new reports. It's like getting a gift. I approach a newly published Sustainability Report with a sense of anticipation and eagerness. I love the first flick through to see what it's all about, and then, I enjoy a more deliberate read and analysis. Yes, it's true. I'm a reporting geek. So thank you to everyone in the sustainability reporting world for helping me to stay so geeky. Thank you.. to everyone who says "no-one reads Sustainability Reports". The more you say it, the more people write reports. Thank you.. to all the CSR and Sustainability Managers at my client companies around the world who give me the opportunity to serve them by doing what I love doing. Thank you.. to all the companies that published Sustainability Reports at any time in the past 15 years. You have enriched my life. My life is now completely materialized, measured and metricated. That's good, right? Thank you.. to the designers who create fabulous report designs. Sustainability Reporting as an art-form has emerged. Thank you.. to my loyal CSR Reporting Blog readers and following. It gives me a totally warm and fuzzy feeling to know that there may just be one or two more reporting geeks out there. Thank you.. to the cleaning staff in all the offices that go around cleaning up after all the people involved in Sustainability Reporting. Aside from the hundreds of discarded drafts, the volume of ice cream cartons that people throw out after consuming the contents at reporting time must be phenomenal. Thank you.. to the students of sustainability from all around the world who often approach me with questions about reporting. I love helping students. Sometimes the questions are really focused... like: What does that word on page 321 mean? and sometimes they are more general, like: Do you think this is REALLY what they meant? Thank you.. to the companies that include me on their stakeholder lists and want me to give them free advice. If they decided to include me in their budget as well, I would thank them more sincerely. Thank you.. to all the babies in the world. Everyone is writing Sustainability Reports JUST FOR YOU! Thank you.. to the companies that publish their Sustainability Reports as ebooks or flip books. You save me a lot of time not reading your reports. Thank you.. to my staff team at Beyond Business who put up with having a geek for a boss, and an awkward one at that. Thank you.. to thanksgiving, for giving me the opportunity to thank the sustainability community for its existence. Thank you.. to Simon Cowell. I love the X Factor. I would love to write the X Factor's Sustainability Report. Thank you.. to the GRI for the Sustainability Disclosure Database. It's a great resource for finding current reports. Real geek-food. Thank you.. to all the millions (millions?) (is exaggeration hereditary?) of people who bought and read my book, Understanding G4: The concise guide to next generation reporting, published by DoSustainability. I receive a lot of feedback from many different people who have read/used the book and found it to be very helpful. Watch out for the sequel ;). But while we are on the subject, thank you also to Alan AtKisson, President and CEO of AtKisson Group, a pioneer of sustainability initiatives and renowned throught-leader, who wrote the best review of any book I ever read and it was about Understanding G4. Thank you.. to numerous friends, colleagues, associates, followers, Twitter pals, Facebook friends, Linkedin members, social media connections who inspire, inform, amuse, encourage, support, engage, retweet, like, comment, forward, share, give Klout and generally feel like a fantastic community of professionals that I am proud to be a part of. Whenever I meet any of you at conferences and meetings, it seems that we grew up together. And at this point I will single out the formidable Leon Kaye who never fails, each EcoMonday and each FollowFriday to publish a CSR Tweep list which I am honored to be included in. He is a generous supporter of people in our community and that deserves more than one thank you. But I have to be careful not to overdose on thankyou's here so I will leave it at one. Thank you.. to all the Sustainability Report translators who translate reports into English. You usually make me smile. Especially if your name is Google Translate. If your name is Bing Translate then I actually roll about on the floor laughing my head off. Thank you.. to all the people who work in companies who publish Sustainability Reports. I am sure you know who you are. Ahem. If you are not sure, thank you anyway. Maybe you contributed even though you don't know it. Thank you.. to my friends in the Sustainability Reporting news communities at Triple Pundit, 2Degrees, 3BL Media and others who reprint my CSR Reporting Blog posts to help spread the Sustainability Reporting gospel to their audiences. I am humbled that you find my content worthy of redistribution. And you don't even edit out the bad bits. Often. 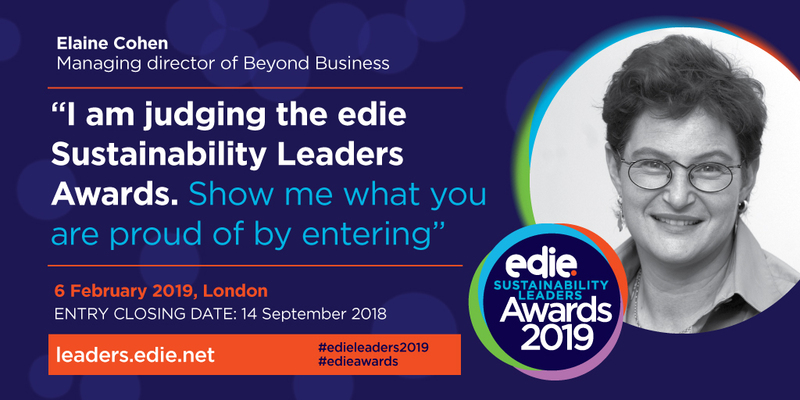 Thank you.. to Faversham House and edie.net for organizing the Smarter Sustainability Reporting Conference, which I chair, every year in London. A whole day all about Sustainability Reporting. It's so much fun. Next one is 24th February 2015 and we have a great line-up. Many geeks and several geeks-in-the-making. Will you be there? Thank you.. to all the people who use Sustainability Reports to help them make decisions. Like which recycling bin to put them in. Or whether to use them to eat your fish and chips out of. I understand in Japan that Sustainability Report Origami has become quite popular. Just think, lots of little origami cranes complete with materiality matrices. Sustainability Reporting makes anything possible. Thank you.. to Siri. When ever I feel like a bit of fun, Siri never lets me down. I think we should let Siri write some Sustainability Reports. Thank you.. to Ethical Corporation for publishing my reviews of newly-published Sustainability Report. It's always nice to have another place to practice being geeky. Thank you.. to my family who reads every single Sustainability Report that I work on for clients. OK. Exaggerating again. But putting up with a geek like me deserves more than thanks. It deserves an ocean of ice cream. Thank you.. to SustainabilityIllustrated for producing fabulous entertaining and informative sustainability videos. Soon to include one on Sustainability Reporting. Watch this space. Haha. Another scoop from the CSR Reporting Blog. Thank you.. to the creators of Sustainability Reporting apps. I admit that I rarely (never) read reports via an app, but it's nice to know Sustainability Reports are appable just like everything else. Maybe someone should invent an app that shows our reactions when we read a Sustainability Report on an app. Thank you.. to the inventor of PDFs. My life would be just terrible without you. Sustainability Reporting to me is synonymous with PDFs. If I don't get my PDF fix every single day, my knees start to shake and my teeth start to clatter. Someone told me that might be due to the fact that my air-conditioning is set to 12 deg celsius. But I know the truth. Thank you.. to Blogger.com and Feedburner. Without you, I would never have been able to reach so many fabulous people who read and subscribe to the CSR Reporting Blog. In our inter-connected digital world, you help me get my message through. What's the message? Sustainability Reporting is cool. It's worth blogging about. Thank you.. to readers and users of Sustainability Reports everywhere, and especially those who give feedback. A Sustainability Report without feedback is like ice without cream. Feedback is what makes Sustainability Reports worthwhile. Whenever you check out a report, take some time to give feedback to the reporting company. It's good karma. You will be rewarded. With another Sustainability Report. Labels: csr, sustainability reporting, thanksgiving. You may have noticed the announcement earlier this month by the GRI that governance changes are afoot. Well, they are more than afoot. They are now signed, sealed and in the bag. Maybe, like me, you didn't really understand what the fuss was all about. GRI wants to be a standard setter. OK. But GRI is a standard setter. But some might say: not really, really - other standard setters have more strictly defined governance structures with separation of responsibilities relating to standard setting. But GRI has a multi-stakeholder process, isn't that a valid governance structure? Not valid enough, apparently. Separation of authority: GRI's CEO will no longer have a role in standards development and a separate Board will oversee this activity. Due process: a stronger Due Process Protocol and a new Due Process Oversight Committee are now being set up. A new acronym or two: GSSB, DPOC, IAC are now part of the GRI lexicon. More money: separate fundraising for standards development and the people who will do it. The benefits to being in the Club are significant. You can wear the badge. You can get included in things designed for standard setters only. You become part of the process as governments and stock exchanges consider new regulation on sustainability disclosure. Think of the rapid development of Sustainable Stock Exchanges around the world and the new EU Directive on non-financial reporting. When you are an official standard setter, these organizations include you and refer to your standards. Why is this so important? Because it brings an additional level of credibility and influence which are beneficial to the development and recognition of GRI standards. It enables dedicated resource to focus on standards development, independent of other organizational priorities. It enables the pace of standards development to move more quickly, as issues are defined, rather than wait for items to reach the top of the GRI very-long to-do list. These are all benefits which should be noticeable in time to the GRI framework-using public and in the advancement of corporate sustainability disclosure. Transparency of all standards development processes (meeting agendas, papers and minutes related to the standards development processes will be made available on GRI’s website). Just to reassure you, this new standard setting stuff does not mean that the GRI framework will become a certifiable standard such as an ISO GRI G40000000 or something like that. At present, the new GSSB has no mandate to go off and move the goalposts. The current plan is that G4 will continue to be a framework that is assurable in the same way that it always has been. No need to go rushing off thinking you've been backed into a standards corner. I had a chat with Bastian Buck, the Director of the Reporting Standard Department. He was the guy that led the development process of the G4 guidelines and in my experience, the go-to guru with great knowledge of reporting standards and their development. ME: Bastian, isn't all this just a big political game with little substance. GRI wants more recognition, more attention and more clout. Is that what it's all about? BASTIAN: It's not just a name-change to be a standard setter. It's not just a cosmetic change. GRI is perceived as a de facto standard setter already by many. However, this change does enable GRI to have more audiences. International developments with governments, legislation and stock exchanges are increasingly relevant for GRI, and this kind of governance structure speaks to these groups more directly. It gives the GRI framework a different type of recognition, based on a transparent process where all those involved are following due process with relevant checks and balances. This has always been the way GRI worked, but the new structure formalizes this and ensures that all our audiences know that we are working in a way that is widely recognized as imperative for standard setters. Not only this, the separation of the standard setting and advocacy work of GRI will be helpful as it will enable us to spend money on improving the standard and applying updates on a timescale which is much closer to the identification of the need. So far, changes in the standard have always been vetted against another organizational priority, and there was not always enough funding to do everything. The new structure will allow for much greater focus and resources for standard setting and is therefore a good thing. ME: What does this mean for reporters? Will reporting companies have to change the way they report? BASTIAN: No, reporters won't notice any direct changes and the G4 guidelines will remain as they are. Going forward, what reporters might notice is that the guidelines may be updated more frequently, taking into account new realities and new considerations. There may be some formatting changes to align the way G4 is produced and updated to the standard setting approach (such as modular elements of the guidelines that can be changed without replacing the entire framework, to allow for easier application of updates) but this is unlikely to make a big difference to what companies are asked to report in G4. ME: Will GRI need to hire more people under this new structure? BASTIAN: Yes, indeed. The commitment to greater transparency, the more frequent updates of the standards, the maintenance and strengthening of the multi-stakeholder framework and consultations will all require more people. We currently have 8 people in the reporting standards team. I envisage this will expend quite a lot in coming years. The upside is that our G4 framework will be more robust, more up-to-date and our processes more transparent. ME: If the GSSB and other new bodies are now independent and reporting to the GRI Board of Directors, does this make the CEO role redundant? What will the CEO do? He will have LOADS of spare time, no? BASTIAN: I doubt the CEO will have too much spare time. GRI has an extensive and ambitious advocacy program and there is still much work to do to spread the word and represent stakeholders in a range of committees and regulatory bodies. GRI is reaching out to other organizations in the sustainability disclosure space to drive greater alignment between standards and greater clarity. The dual focus of GRI going forward which will be on standard-setting and enhancing the value of reporting. The latter will require innovation in the way we think about reporting and collaboration with groups we haven’t previously connected with. We have many initiatives in place and planned that will enhance the quality of service and support we provide for reporters around the world. The new structure will enable this part of the work to proceed with focus, just as it will help the standard setting part of the work proceed independently and in line with disclosure needs. ME: Who is going to pay for all of this? BASTIAN: Fundraising for the new GSSB is starting to happen now that the new structure has been announced. There are a number of ongoing conversations. This is a good opportunity for those who have an interest in supporting this specific work to channel their funding towards standards development. We expect that this will be attractive to organizations or individuals that may not have offered funding to GRI in the past. As GRI moves forward, it will be interesting to watch how this new structure falls into place and what it actually helps create. Will we see G5, G6 and G7 in quick succession? Or a number of standards positioned under the umbrella of Sustainability Reporting Standards? Or will we see a War of the Standards unfold with every sustainability disclosure organization trying to be not only a standard setter but THE standard setter? We have heard a lot about collaboration but we are yet to see any terribly obvious fruits of such collaboration. Several months back, the IIRC announced the launch of the Corporate Reporting Dialogue to "promote greater coherence, consistency and comparability between corporate reporting frameworks", with all the known standard setters taking part. We haven't heard much since then. Maybe having everyone now in the same Club might help move things along. By now you will all have seen the Samsung report rap, as well as all the criticisms (facepalm). I guess we should give Samsung top marks for creativity and originality (any other report raps out there?) but pretty close to zero when it comes to intelligence and genius marketing. It defies understanding how the Samsung lyrics (Samsung, we 280,000 humans 40 percent 112,000 women You don’t have to worry after giving birth Sit back, relax, no need to work) got approved at any level of the organization. However, don't throw the baby out with the bathwater, as they say. Maybe rapping reports is a good thing. With a little help from Wiki How to write a rap song, I thought it might be a good idea to offer some ideas to other companies that might want to move to the next stage in advanced and innovative reporting communications techniques. And now for my third and final post about my adventures in Atlanta at the World Business Council for Sustainable Development (WBCSD) Council Meetings last week. I has to share this piece, as it's where everything comes together, and also, one of the most fun-important parts of the WBCSD activities. It's about the Future Leaders of our businesses and our sustainability efforts. WBCSD has a fabulous program to educate future business leaders of the WBCSD member companies. It's a year-long program that provides tomorrow’s business leaders with "the skills and competencies to cope with an increasingly complex world as well as the social and environmental challenges across a changing competitive landscape." Each year is themed, and the 2015 program is all about "scaling up business actions on climate change & improving the business case" with modules in the U.S., Hong Kong and Paris. Wow. Wish I were 10, 20, ok 30 years younger. The 2014 Future Leaders Program (FLP) was populated with young up-and-coming mainly finance professionals from member companies and its theme was "Bridging the Capitals: Accounting for Natural & Social Capital in Business Decision Making". 25 young business people worked on this for a year, and delivered impressive outputs at the close of the program. In five teams, they worked on different aspects of the Bridging the Capitals theme and created reports that contain genuinely original and useful insights about reporting, measurement, materiality and more. I highly recommend you take a look at some or all of these publications. I have read them all end-to-end and it was worth it. Integrated Reporting in South Africa - From Concept to Practice: insights from interviews with South African reporting companies and investors. Unraveling the Business Value Landscape: defining what value really means and recommendations on how to describe business value. Integrated Performance Management: a quality approach to following through on sustainability commitments. Sustainability - A new competence for financial leaders: a guide to help finance folks understand, navigate and even influence the sustainability agenda. Journey to materiality- A guide to achieve corporate goals by applying materiality to environmental, social and governance issues: views and recommendations around the challenges of defining materiality. VALUE: It may still be of value even if it you can't put a money number on it. IMPACTS: We must talk impacts not actions and get better at defining them. TRANSPARENCY: Transparency is not the goal, relevant transparency is the goal. ACCOUNTABILITY: The finance function must be accountable to all its stakeholders. In talking to these points, I shared some true (and in some cases, quite incredible) stories from my own experience as a business person over thirty years, and from my work with clients (no names named!). I won't fill up this post with stories ... but I will comment briefly on each part of the model. VALUE: It may still be of value even if it you can't put a money number on it. Essentially, here, despite a week about capitals, costing externalities, measurement and metrics, I couldn't help but make the point that not everything can be quantified scientifically. For example, the impact of corporate culture. Sure, we can measure employee engagement, retention, attrition, satisfaction, development and even conflict in an organization, and we can measure the cost of non-compliance or non-ethical conduct to some degree, but can we truly measure a the money value of a culture that is ethical, open and empowering? In corporate cultures where there are aspects of complicity, lack of freedom to express new ideas or lack of respect for human worth, the ripple effects are far-reaching but we don't know exactly how to count them. As young leaders, especially ones with a head for finance, it is crucially important to remember that, at the end of the day, business is just people trying to survive and thrive. Valuing them and valuing values is just as important as valuing value. Even if you can't count it. IMPACTS: We must talk impacts not actions and get better at defining them. I have said this many times, and often refer to "shopping-list" reports where I get what companies did but I didn't get what difference it made. Companies, and finance experts in companies, are soooooo good at calculating the last cent of the return on a capital investment. Yet companies are proud to say they donated (or even invested) tens of millions of $ in the community when they have no idea what a difference it made. We need to get better at why we are doing stuff and what impact we are trying to have. The ways of calculating impacts are partly about money but also about a range of intangibles that affect people lives which are harder to calculate. But that doesn’t mean we should ignore these impacts or even attempt to define them in at the planning stage. I work with a company called Netafim. Netafim is a world leader in drip irrigation – a climate-smart agricultural process that enables better yields, using less water and less fertilizer and less energy. The economic cost benefits of drip irrigation can be calculated and in each market, Netafim has amassed a range of data that supports and quantifies the environmental and economic impacts of using drip irrigation. However, there are also many intangibles. How do you factor them into the equation? How do you design them into the planning? Rachel Shaul, the Marketing Director of Netafim went to Gujarat in India to talk to women farmers as part of a research project. Women's empowerment is a big thing in smallholder agriculture. The impact of using drip irrigation for them was the possibility of sending their kids to school, being able to buy a house for the first time or the ability to help other women become independent and self-sufficient. How do you calculate the impact of that? Can you monetize that? Where would that get prioritized in the allocation of resources? Are these kind of impacts defined up front or are they a by-product that happens by doing business differently? Intuitively, supporting women smallholders makes sense. Objectively, data shows their economic situation improves. But how are all the other impacts on the quality of their lives calculated? When you are looking at the difference your company makes, these are the sort of things that should also be understood more deeply and taken into account. We must get better at defining impacts in economic, social or environmental terms. We must get better at getting clearer about how a company is changing the world. And we must plan more holistically to deliver the impacts we desire to deliver. Some of that is about money, some of it is not. TRANSPARENCY: Transparency is not the goal, relevant transparency is the goal. Everyone talks transparency, everyone believes that transparency is the goal. Everyone thinks that if they cram as much information as possible into a sustainability report or a website, that they will improve their reputation. Well, that may be. But in this world of overload, and with the increasing complexity of business, we don't need or want to know EVERYTHING. We want to know the most important things. How are those things defined and by whom? It's not easy. A materiality process can be designed to deliver the results you want to achieve. Getting granular and relevant on materiality requires good engagement. Engagement does not mean sending out a survey or having a meeting about your next contract with a supplier. Engagement means truly understanding the measure of impact you are having in a specific context and looking for the business risk and opportunities associated with that. ACCOUNTABILITY: The finance function must be accountable to all its stakeholders. As finance managers or business leaders, who are your stakeholders? Who is affected by the impact of your decisions? Employees, of course. Management and their ability to advance positive reputation for your company and support business success, of course. But beyond that? Who do you have an impact on? What are the policies that you create that have an impact on society, the environment, the well-being of communities? How you establish investment policies, payment terms, restructuring frameworks and more? These all have an impact on the lives of people. This is often highly relevant when businesses undergo restructuring. The key partners in any company that manage processes such as these are the Human Resources and the Finance teams. We decide, with our policies, whether people have a future or what kind of future they can start to plan. It's that simple. U.S. Census data shows that more than 7 percent of American workers fell below the poverty line in 2012. Similar figures show up in Europe. Workers. Not people sitting on a beach somewhere. Workers. Going out every morning to a job and coming home and not being able to maintain a decent standard of living. Who's responsible for that ? HR? Finance? No-one? The competitive landscape? In the post-2015 agenda, the UN has begun to talk about eradicating poverty. Business has a role to play here, and so do finance managers and other business leaders. Who are your stakeholders? Are they the working poor? Or are they your management who wants to make more profit and show a better balance sheet? Of course a business must make money, profit is crucial to any business. But ultimately finance and business managers must be accountable for the impacts of their decisions, policies and actions on the way people live. And these elements must be factored into day-to-day decisions as well as in the bigger strategic directions. This means considering all stakeholder impacts up-front in the decision-making process, and not just about balancing a budget. As well as considering the long-term impact of doing business in a world where poverty is omnipresent. Behind every number is someone's life. This isn't about the financial crisis, or big events that need big responses. This is about the day-to-day of our jobs and how they have an impact on stakeholders. That was pretty much my message to these young leaders. VITA: Value, Impacts, Transparency and Accountability. That's the legacy. That's the 2030 resume. You'll notice that most of what I said was about people not about money and not about numbers. As young business leaders, this group has the power to make change and impact people's lives for the better. They can drive a different way of doing business that is led from a new vision, a new way of thinking about the role of business in society, a new way of creating value and a new way of being accountable. In some cases, that means accounting for externalities. In other ways, it means being a decent person and making decent decisions. It always means knowing what impact you are having on all your stakeholders. Finally, with this third and final piece in a trilogy of posts, I want to extend my personal thanks and gratitude to the folks on the WBCSD team that totally impressed my with their dedication, drive and skill and made me feel so welcome. Triple fudge with sprinkles to Rodney Irwin, Anne-Leonore Boffi and Susanne Feinman. PS: One thing can't resist adding. 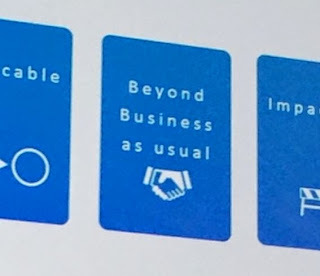 I was very pleased to see in Peter White's (WBCSD COO) plenary presentation about WBCSD priorities, that he mentioned my company, Beyond Business Ltd. Hahahahah. Well, he didn't really. But it looks like he did. Or maybe it's just a case of "great minds think alike"!